London Commission of Oyer and Terminer. Thursday, 12th January, 1659. Afternoon. 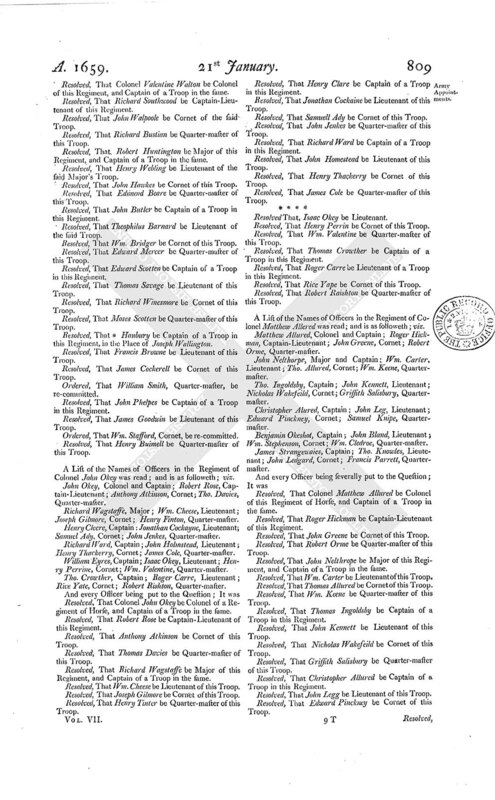 ORDERED, That the late Treasurers at War do, out of the Money remaining in their Hands, pay the Sum of Six hundred and Seventeen Pounds Fifteen Shillings Two-pence to Lieutenant-Colonel Miller in pursuance of an Order of the Committee for the Army, of the 28th of December 1659, upon Account, for the Soldiers in the Six Companies of Foot late in the Tower, in full of the Sum of One thousand Four hundred and Fifty Pounds, mentioned in the said Order: And that the Committee of Inspections see the same done, according to their former Instructions. A Letter from General Monck, from Newcastle, of the 6th of January 1659, was read. He was called in; and, being at the Bar, made a Relation of what General Monck had given him in Charge: Whereupon he delivered in Two Letters; and withdrew; viz. A Letter from the Lord Mayor, Aldermen, and Commons, in Common Council assembled; directed to General Monck; dated the 29th of December 1659: And, a Letter from General Monck, from Newcastle, of the 6th of January 1659, in Answer to the Letter of the Lord Mayor, Aldermen, and Common Council of the City of London: Which were read. And being again called in, he made a Relation of what else was given him in Charge by General George Monck: And afterwards withdrew. Ordered, That the Sum of One hundred Pounds be given to Mr. Gumbe: And that it be referred to the Council of State, to see the same forthwith paid to him, or his Assigns, accordingly. 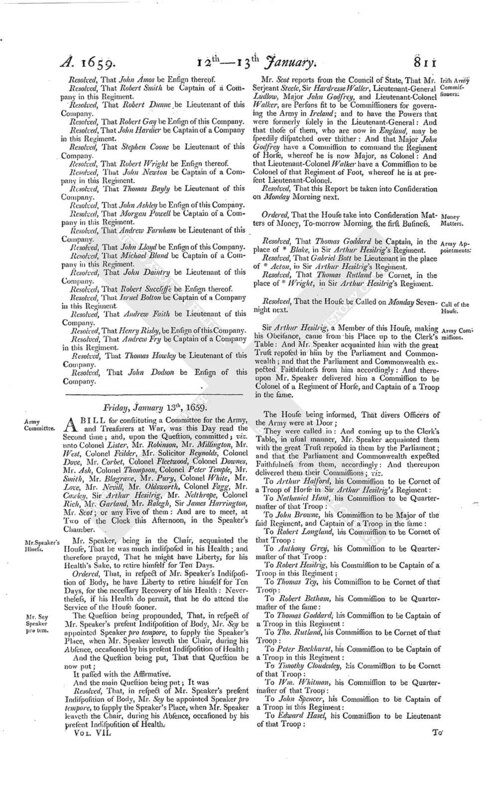 Ordered, That the Particulars related by Mr. Gumble be referred to the Council of State; and touching what Persons are fit to be Judges in Scotland: And that they report their Opinion therein to the Parliament. Resolved, That the Parliament doth justify and approve of what General George Monck hath done, in taking up Horses; and in his Marching into England; and all other Things by him acted and done, in order to the Service of the Parliament and Commonwealth. Ordered, That an Act for the Justifying and Approving of what General Monck hath done be prepared, and brought in, accordingly; And that Mr. Solicitor-General do prepare and bring in the same accordingly. Resolved, That this House will take Mr. Gumble into further Consideration, for his Preferment, as Conveniency shall be offered. Ordered, That it be referred to the Committee of Inspections, to call the Treasurers to accompt for the Twenty thousand Pounds assigned to the Forces in Scotland; and to consider, How Monies may be provided for present Supply of the Forces under the Command of General Monck; and to make the Report To-morrow Morning. Ordered, That a Letter of Thanks be written to Major-General Morgan, taking Notice of his Faithfulness and good Service for the Parliament and Commonwealth: And that Mr. West do draw the said Letter: And that Mr. Speaker do sign and seal the said Letter. Ordered, That Wm. Lenthall, Speaker of the Parliament, be, and is hereby, authorized and required to grant a Commission of Oyer and Terminer, and Gaol-Delivery of Newgate, in London, to such Commissioners as he shall think fit; and to sign a Docket for passing the said Commission, under the Great Seal: And that he pass the said Commission, under the Great Seal accordingly. A Letter from Lieutenant-General Ludlow from aboard, the Oxford Frigate, in the Bay of Dublyn, of the Second of January 1659, was read. A Letter from Mr. Miles Corbett, from Hentland-Milford, of the Sixth Day of January 1659, was read. Ordered, That these Letters be referred to the Council of State: And they are to bring in the Names of Persons for Government of Ireland; and to bring in Instructions; and make their Report thereof To-morrow Morning. A Bill for constituting Commissioners, for Ordering and Managing of the Affairs of the Admiralty and Navy, was this Day read the Second time; and, upon the Question, committed unto Mr. Robinson, Colonel Walton, Colonel Thompson, Mr. West, Sir Arthur Hesilrig, Mr. 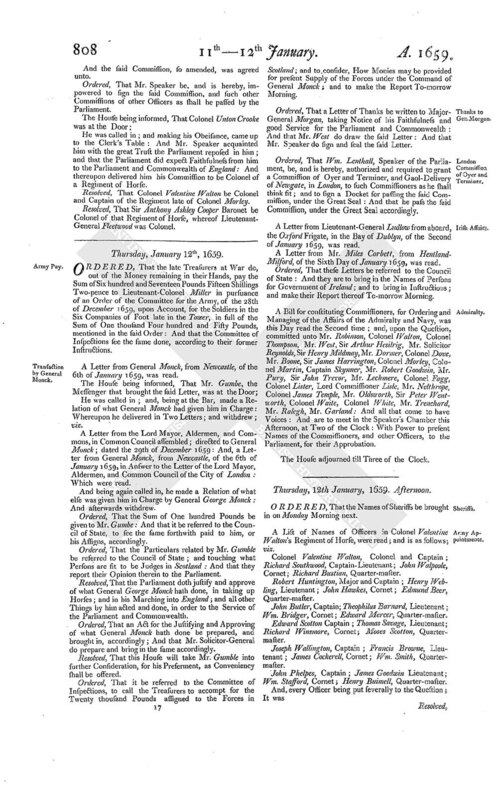 Solicitor Reynolds, Sir Henry Mildmay, Mr. Dormer, Colonel Dove, Mr. Boone, Sir James Harrington, Colonel Morley, Colonel Martin, Captain Skynner, Mr. Robert Goodwin, Mr. Pury, Sir John Trevor, Mr. Lechmere, Colonel Fagg, Colonel Lister, Lord Commissioner Lisle, Mr. Nelthrope, Colonel James Temple, Mr. Oldsworth, Sir Peter Wentworth, Colonel Waite, Colonel White, Mr. Trenchard, Mr. Ralegh, Mr. Garland: And all that come to have Voices: And are to meet in the Speaker's Chamber this Afternoon, at Two of the Clock: With Power to present Names of the Commissioners, and other Officers, to the Parliament, for their Approbation. The House adjourned till Three of the Clock. ORDERED, That the Names of Sheriffs be brought in on Monday Morning next. A List of Names of Officers in Colonel Valentine Walton's Regiment of Horse, were read; and is as follows; viz. Colonel Valentine Walton, Colonel and Captain; Richard Southwood, Captain-Lieutenant; John Walpoole, Cornet; Richard Bustian, Quarter-master. Robert Huntington, Major and Captain; Henry Webling, Lieutenant; John Hawkes, Cornet; Edmund Beer, Quarter-master. John Butler, Captain; Theophilus Barnard, Lieutenant; Wm. Bridger, Cornet; Edward Mercer, Quarter-master. Edward Scotton Captain; Thomas Savage, Lieutenant; Richard Winsmore, Cornet; Moses Scotton, Quarter-master. Joseph Wallington, Captain; Francis Browne, Lieutenant; James Cockerell, Cornet; Wm. Smith, Quarter-master. John Phelpes, Captain; James Goodwin Lieutenant; Wm. Stafford, Cornet; Henry Buimell, Quarter-master. Resolved, That Colonel Valentine Walton be Colonel of this Regiment, and Captain of a Troop in the same. Resolved, That Richard Southwood be Captain-Lieutenant of this Regiment. Resolved, That John Walpoole be Cornet of the said Troop. Resolved, That Richard Bustian be Quarter-master of this Troop. Resolved, That Robert Huntington be Major of this Regiment, and Captain of a Troop in the same. Resolved, That Henry Webling be Lieutenant of the said Major's Troop. Resolved, That John Hawkes be Cornet of this Troop. Resolved, That Edmund Beare be Quarter-master of this Troop. Resolved, That John Butler be Captain of a Troop in this Regiment. Resolved, That Theophilus Barnard be Lieutenant of the said Troop. Resolved, That Wm. Bridger be Cornet of this Troop. Resolved, That Edward Mercer be Quarter-master of this Troop. Resolved, That Edward Scotten be Captain of a Troop in this Regiment. Resolved, That Thomas Savage be Lieutenant of this Troop. Resolved, That Richard Winesmore be Cornet of this Troop. Resolved, That Moses Scotten be Quarter-master of this Troop. Resolved, That * Hanbury be Captain of a Troop in this Regiment, in the Place of Joseph Wallington. Resolved, That Francis Browne be Lieutenant of this Troop. Resolved, That James Cockerell be Cornet of this Troop. Ordered, That William Smith, Quarter-master, be re-committed. Resolved, That John Phelpes be Captain of a Troop in this Regiment. Resolved, That James Goodwin be Lieutenant of this Troop. Ordered, That Wm. Stafford, Cornet, be re-committed. Resolved, That Henry Buimell be Quarter-master of this Troop. A List of the Names of Officers in the Regiment of Colonel John Okey was read; and is as followeth; viz. John Okey, Colonel and Captain; Robert Rose, Captain-Lieutenant; Anthony Atkinson, Cornet; Tho. Davies, Quarter-master. Richard Wagstaffe, Major; Wm. Cheese, Lieutenant; Joseph Gilmore, Cornet; Henry Finton, Quarter-master. Henry Cleere, Captain: Jonathan Cockayne, Lieutenant; Samuel Ady, Cornet; John Jenkes, Quarter-master. Richard Ward, Captain; John Holmstead, Lieutenant; Henry Thackerry, Cornet; James Cole, Quarter-master. William Eyres, Captain; Isaac Okey, Lieutenant; Henry Perrine, Cornet; Wm. Valentine, Quarter-master. Tho. Crowther, Captain; Roger Carre, Lieutenant; Rice Yate, Cornet; Robert Rishton, Quarter-master. Resolved, That Colonel John Okey be Colonel of a Regiment of Horse, and Captain of a Troop in the same. Resolved, That Robert Rose be Captain-Lieutenant of this Regiment. Resolved, That Anthony Atkinson be Cornet of this Troop. Resolved, That Thomas Davies be Quarter-master of this Troop. Resolved, That Richard Wagstaffe be Major of this Regiment, and Captain of a Troop in the same. Resolved, That Wm. Cheese be Lieutenant of this Troop. Resolved, That Joseph Gilmore be Cornet of this Troop. Resolved, That Henry Tinter be Quarter-master of this Troop. Resolved, That Henry Clare be Captain of a Troop in this Regiment. Resolved, That Jonathan Cockaine be Lieutenant of this Troop. Resolved, That Samuell Ady be Cornet of this Troop. Resolved, That John Jenkes be Quarter-master of this Troop. Resolved, That Richard Ward be Captain of a Troop in this Regiment. Resolved, That John Homestead be Lieutenant of this Troop. Resolved, That Henry Thackerry be Cornet of this Troop. Resolved, That James Cole be Quarter-master of this Troop. Resolved That, Isaac Okey be Lieutenant. Resolved, That Henry Perrin be Cornet of this Troop. Resolved, That Wm. Valentine be Quarter-master of this Troop. Resolved, That Thomas Crowther be Captain of a Troop in this Regiment. Resolved, That Roger Carre be Lieutenant of a Troop in this Regiment. Resolved, That Rice Yape be Cornet of this Troop. Resolved, That Robert Raishton be Quarter-master of this Troop. A List of the Names of Officers in the Regiment of Colonel Matthew Allered was read; and is as followeth; viz. Matthew Allured, Colonel and Captain; Roger Hickman, Captain-Lieutenant; John Greene, Cornet; Robert Orme, Quarter-master. John Nelthorpe, Major and Captain; Wm. Carter, Lieutenant; Tho. Allured, Cornet; Wm. Keene, Quarter-master. Tho. Ingoldsby, Captain; John Kennett, Lieutenant; Nicholas Wakefeild, Cornet; Griffith Salisbury, Quarter-master. Christopher Alured, Captain; John Leg, Lieutenant; Edward Pinckney, Cornet; Samuel Knipe, Quarter-master. Benjamin Okeshot, Captain; John Bland, Lieutenant; Wm. Stephenson, Cornet; Wm. Cledroe, Quarter-master. James Strangewaies, Captain; Tho. Knowles, Lieutenant; John Ledgard, Cornet; Francis Parrett, Quarter-master. Resolved, That Colonel Matthew Allured be Colonel of this Regiment of Horse, and Captain of a Troop in the same. Resolved, That Roger Hickman be Captain-Lieutenant of this Regiment. Resolved, That John Greene be Cornet of this Troop. Resolved, That Robert Orme be Quarter-master of this Troop. Resolved, That John Nelthrope be Major of this Regiment, and Captain of a Troop in the same. Resolved, That Wm. Carter be Lieutenant of this Troop. Resolved, That Thomas Allured be Cornet of this Troop. Resolved, That Wm. Keene be Quarter-master of this Troop. Resolved, That Thomas Ingoldsby be Captain of a Troop in this Regiment. Resolved, That John Kennett be Lieutenant of this Troop. Resolved, That Nicholas Wakefeild be Cornet of this Troop. Resolved, That Griffith Salisbury be Quarter-master of this Troop. Resolved, That Christopher Allured be Captain of a Troop in this Regiment. Resolved, That John Legg be Lieutenant of this Troop. Resolved, That Edward Pinckney be Cornet of this Troop. Resolved, That Samuel Knipe be Quarter-master of this Troop. Resolved, That BenjaminOkeshot be Captain of a Troop in this Regiment. Resolved, That John Bland be Lieutenant of this Troop. Resolved, That Wm. Stephenson be Cornet of this Troop. Resolved, That Wm. Cletheroe be Quarter-master of this Troop. Resolved, That Thomas Knowles be Lieutenant of this Troop. Resolved, That John Legard be Cornet of this Troop. Resolved, That Francis Parret be Quarter-master of this Troop. A List of the Names of Officers in the Regiment of Sir Arthur Hesilrig were read; and is as followeth; viz. Sir Arthur Hesilrig Baronet, Colonel and Captain; Samuel Palmer, Captain-Lieutenant; Arthur Halford, Cornet; Nathaniel Hunt, Quarter-master. John Browne, Major and Captain; Edmund Rivers, Lieutenant; Robert Longland, Cornet; Anthony Grey, Quarter-master. Robert Hesilrig Esquire, Captain; Tho. Wansey, Lieutenant; Tho. Teigh, Cornet, Robert Betham, Quarter-master. Alexander Blake, Captain; Tho. Acton, Lieutenant; John Wright, Cornet; Tho. Pope, Quarter-master. Peter Backhurst, Captain; Edward Browne, Lieutenant; Timothy Clowdesley, Cornet; Wm. Whitman, Quarter-master. John Spencer, Captain; Edward Hasell, Lieutenant; Silvester Salsbury, Cornet; Edward Nest, Quarter-master. Resolved, That Sir Arthur Hesilrig be Colonel of this Regiment of Horse, and Captain of a Troop in the same. Ordered, That Samuel Palmer be re-committed. Resolved, That Arthur Halford be Cornet of this Troop. Resolved, That Nath. Hunt be Quarter-master of this Troop. Resolved, That John Browne be Major of this Regiment, and Captain of a Troop in the same. Resolved, That Edmund Rivers be Lieutenant of this Troop. Resolved, That Robert Longland be Cornet of this Troop. Resolved, That Anthony Gray be Quarter-master of this Troop. Resolved, That Robert Hesilrig Esquire be Captain of a Troop in this Regiment. Resolved, That Thomas Wansey be Lieutenant of this Troop. Resolved, That Thomas Lea be Cornet of this Troop. Resolved, That Robert Betham be Quarter-master of this Troop. Resolved, That Alexander Blake be Captain of a Troop in this Regiment. Resolved, That Thomas Acton be Lieutenant of this Troop. Resolved, That John Wright be Cornet of this Troop. Resolved, That Thomas Pope be Quarter-master of this Troop. Resolved, That Peter Backhurst be Captain of a Troop in this Regiment. Resolved, That Edmund Browne be Lieutenant of this Troop. Resolved, That Timothy Clowdesley be Cornet of this Troop. Resolved, That Wm. Whittington be Quarter-master of this Troop. Resolved, That John Spencer be Captain of a Troop in this Regiment. Resolved, That Edward Hasle be Lieutenant of this Troop. Resolved, That Silvester Salisbury be Cornet of this Troop. Resolved, That Edward Nest be Quarter-master of this Troop. A List of the Names of Officers in Colonel Smithson's Regiment of Horse was read. Ordered, That Edward Bullock, and Five others, to be named by Mr. Speaker, be, and are hereby recommended to the Commissioners for the Army, for Employment as Officers. 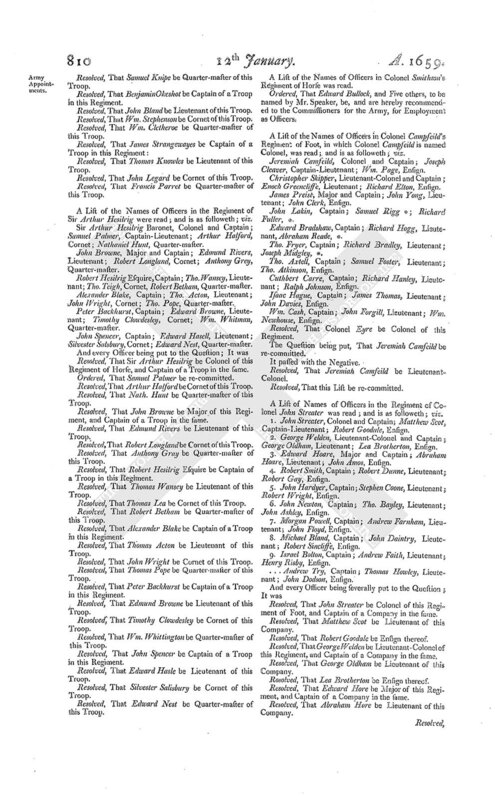 A List of the Names of Officers in Colonel Campfeild's Regiment of Foot, in which Colonel Campfeild is named Colonel, was read; and is as followeth; viz. Jeremiah Camfeild, Colonel and Captain; Joseph Cleaver, Captain-Lieutenant; Wm. Page, Ensign. Christopher Skipper, Lieutenant-Colonel and Captain; Enoch Greencliffe, Lieutenant; Richard Elton, Ensign. James Preist, Major and Captain; John Yong, Lieutenant; John Clerk, Ensign. John Lakin, Captain; Samuel Rigg *; Richard Fuller, *. Edward Bradshaw, Captain; Richard Hogg, Lieutenant, Abraham Reade, *. Tho. Fryer, Captain; Richard Bradley, Lieutenant; Joseph Midgley, *. Tho. Axtell, Captain; Samuel Foster, Lieutenant; Tho. Atkinson, Ensign. Cuthbert Carre, Captain; Richard Hanley, Lieutenant; Ralph Johnson, Ensign. Isaac Hague, Captain; James Thomas, Lieutenant; John Davies, Ensign. Wm. Cash, Captain; John Forgill, Lieutenant; Wm. Newhouse, Ensign. Resolved, That Colonel Eyre be Colonel of this Regiment. The Question being put, That Jeremiah Camfeild be re-committed. Resolved, That Jeremiah Camfeild be Lieutenant-Colonel. Resolved, That this List be re-committed. A List of Names of Officers in the Regiment of Colonel John Streater was read; and is as followeth; viz. 1. John Streater, Colonel and Captain; Matthew Scot, Captain-Lieutenant; Robert Goodale, Ensign. 2. George Welden, Lieutenant-Colonel and Captain; George Oldham, Lieutenant; Lea Brotherton, Ensign. 3. Edward Hoare, Major and Captain; Abraham Hoare, Lieutenant; John Amos, Ensign. 4. Robert Smith, Captain; Robert Dunne, Lieutenant; Robert Gay, Ensign. 5. John Hardyer, Captain; Stephen Coone, Lieutenant; Robert Wright, Ensign. 6. John Newton, Captain; Tho. Bayley, Lieutenant; John Ashley, Ensign. 7. Morgan Powell, Captain; Andrew Farnham, Lieutenant; John Floyd, Ensign. 8. Michael Bland, Captain; John Daintry, Lieutenant; Robert Sincliffe, Ensign. 9. Israel Bolton, Captain; Andrew Faith, Lieutenant; Henry Risby, Ensign.
. . . Andrew Try, Captain; Thomas Howley, Lieutenant; John Dodson, Ensign. Resolved, That John Streater be Colonel of this Regiment of Foot, and Captain of a Company in the same. Resolved, That Matthew Scot be Lieutenant of this Company. Resolved, That Robert Goodale be Ensign thereof. Resolved, That George Welden be Lieutenant-Colonel of this Regiment, and Captain of a Company in the same. Resolved, That George Oldham be Lieutenant of this Company. Resolved, That Lea Brotherton be Ensign thereof. Resolved, That Edward Hore be Major of this Regiment, and Captain of a Company in the same. Resolved, That Abraham Hore be Lieutenant of this Company. Resolved, That John Amos be Ensign thereof. Resolved, That Robert Smith be Captain of a Company in this Regiment. Resolved, That Robert Dunne be Lieutenant of this Company. Resolved, That Robert Gay be Ensign of this Company. Resolved, That John Hardier be Captain of a Company in this Regiment. Resolved, That Stephen Coone be Lieutenant of this Company. Resolved, That Robert Wright be Ensign thereof. Resolved, That John Newton be Captain of a Company in this Regiment. Resolved, That Thomas Bayly be Lieutenant of this Company. Resolved, That John Ashley be Ensign of this Company. Resolved, That Morgan Powell be Captain of a Company in this Regiment. Resolved, That Andrew Farnham be Lieutenant of this Company. Resolved, That John Lloyd be Ensign of this Company. Resolved, That Michael Bland be Captain of a Company in this Regiment. Resolved, That John Daintry be Lieutenant of this Company. Resolved, That Robert Succlifse be Ensign thereof. Resolved, That Israel Bolton be Captain of a Company in this Regiment. Resolved, That Andrew Faith be Lieutenant of this Company. Resolved, That Henry Risby, be Ensign of this Company. Resolved, That Andrew Fry be Captain of a Company in this Regiment. Resolved, That Thomas Howley be Lieutenant of this Company. Resolved, That John Dodson be Ensign of this Company.